With cameras, smaller is generally better—until you get so small that you sacrifice key features for the sake of miniaturization. 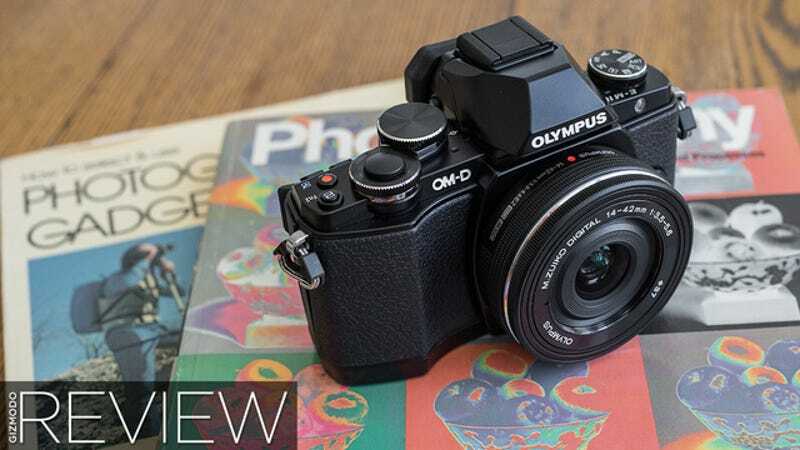 The Olympus OM-D E-M10 mirrorless camera tries to strike the right balance, and gets a lot of things right. A $700 micro four thirds camera (body only) with the same 16 megapixel sensor as the venerable OM-D E-M1. It has the body of a shrunken OM-D E-M5, with a few new features, and a few left out. 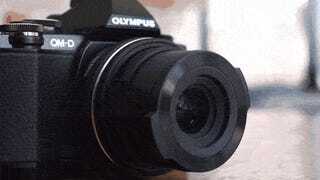 This camera should appeal most to people who are in love with the OM-D style, but want something a little cheaper. Last year's $1400 E-M1 was outfitted for pros, while the E-M10 is targeted at the more casual photographer. Within the larger mirrorless ecosystem, the E-M10 has a bunch of contenders at this price point. Sony and Fuji both have bodies under $700 with larger sensors, and Panasonic's flagship still camera, the GX7, is currently running only slightly more expensive than the E-M10. Needless to say, there's no shortage of competition for Olympus here. It's the first affordable(ish) addition to the excellent OM-D line. And it's a highly attractive option, depending on how much you care about the pared-down options. It is almost the exact same E-M5 body, just smaller and more adorable (seriously, this thing is cute to the bone). Despite its diminutive size, the E-M10 feels comfortable to grasp thanks to its lightness. The front grip is small, but a protruding thumb rest on the back helps a lot. Button and dial layout is superb, almost matching that of the E-M5. On the top right is a simple mode dial, and on the top left are two exposure dials, two custom function buttons, an image review button, and video record button. The rear panel features a directional pad and your standard info, menu, and delete buttons. The only misstep here is the power switch, inherited from the E-M5, which sits low on the rear panel; it's hard to access if you are carrying the camera one-handed. The remaining buttons include a display toggle and flash activator, both flanking the viewfinder hump. Basic functionality of the E-M10 is much the same as OM-D E-M5. It has the same best-in-class autofocus, same snappy responsiveness, same 1.44 million dot electronic viewfinder, and the same great image quality. In fact, it might be even better, due to its lack of anti-aliasing filter. It's a highly capable camera by any measure. But its smaller size does necessitate some compromises. First among them? The EM-10 is not weather sealed like the E-M5 and E-M1. That means no rainy days or dust storm shoots for you. It also has a 3-axis sensor stabilization system instead of the 5-axis system of the E-M5 and E-M1. In practice, the 3-axis works great, and the difference between the beefier version is slim, if noticeable at all. You will still be fine shooting stationary subjects at 1/30 of a second, or even 1/10 if you have a steady hand. In the plus column, the E-M10 has a built-in flash, something no other OM-D does. It's only really suitable for making typically bland straight-on flash photos, but it's helpful in a pinch when your family is hounding you for a group shot in a dark restaurant. 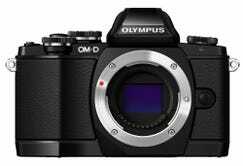 Honestly, those are the only major points to keep in mind with regard to where the E-M10 falls in the Olympus lineup. As far as the general experience shooting with the camera, it is mostly pleasant, with solid battery life and responsiveness. Our biggest knock is that size does become an issue in a couple of ways. As much as I love that a $700 camera features a serious manual control scheme, I felt a bit cramped operating the two top dials with my face up to the viewfinder. I was almost poking myself in the eye while turning the shutter-speed dial with my thumb. It's nothing you can't work around or get used to (or you can just buy the grip extender for $60), and it's a non-issue when simply using the larger display, but it's not ideal. Size also came into play when I tried to mount some of the larger lenses in the micro four thirds line on the E-M10. A long telephoto zoom or even the hefty 12-40mm f/2.8 PRO lens could make the camera feel a bit off balance. There are two brand new Olympus lenses that both fit the small profile of the E-M10. The 14-42mm f/3.5-5.6 pancake zoom lens is insanely compact when it's not extended after power-up. The new lens does outperform the old 14-42mm, but the coolest thing about it is its new lens cap, which opens and closes as the camera is switched on and off. It's much like the built in lens-caps of small point-and-shoot cameras, except it's removable. It's a joy not having to fumble around with a lens cap every time you go out and shoot. Unfortunately the new cap is sold separately for a whopping $40, and only works on that one particular lens. As nifty as the pancake zoom is, I would strongly recommend a fast prime like the crisp and wonderful new 25mm f/1.8, which is like a 50mm lens on a full-frame camera, perfect for everyday use. A lens like this with a large aperture will help make up for the weaknesses of micro four thirds cameras, namely their low-light performance and long depth of field. The E-M10 produces wonderful images as long as you use quality glass. JPG processing is fine, but we always recommend shooting RAW unless you are rapidly sharing files online right after shooting. Unfortunately, we found it difficult to evaluate the RAW images because Adobe does not yet support the E-M10 for viewing in Lightroom or Photoshop. We tried to use the Olympus Viewer that comes with the camera, but no matter what settings we messed with, the software was still baking in some noise reduction, which inevitably turns grain and fine detail to mush. Despite having to wait for Adobe to update its RAW compatibility, it is safe to say that the images are terrific. Look at any test of the E-M1 on the internet, and you will find the same great quality in the E-M10. Video quality is fine, not terrific, but being able to shoot steadily with the 3-axis stabilization for super-smooth home videos, like the one below of my cat washin' up, is a lot of fun. Yes, there are small sacrifices inherent to the micro four thirds format, such as slightly noisier images and less shallow depth-of-field than larger sensor cameras, but the differences are nothing to get too hung up over. The E-M10 is aesthetically brilliant. It's small but still retains a great viewfinder and set of manual controls for experienced photographers. The 3-axis image stabilization is a killer feature, and is almost as good as the 5-axis system you'll find on more expensive bodies. Stepping down from more expensive micro four thirds cameras, there is no compromise in terms of image quality, and you will relish the access to a wide range of compact, high-quality lenses. The top dials can feel a bit cramped when using the viewfinder. Larger lenses may cause the camera to feel too front-heavy with not enough grip. The lack of weather sealing prevents it from being perfect for travel. The price is a bit too close to other mirrorless options that offer more. I would love to argue for the E-M10 to be a great all-around deal because it is so much fun to hold and shoot with. However, when you look closely at the $700 price-point, it's hard to make the case. 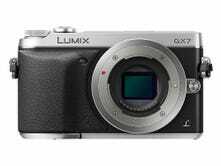 The Panasonic GX-7 is $750 for the body on Amazon right now, with a higher-resolution EVF and a faster max shutter speed. If you really want something compact, the Panasonic GM1 is also $700, but in my opinion, even as small as it is, it's still not pocketable with most lenses, and it doesn't have a good set of physical dials. Both Sony and Fujifilm have bodies that offer better image quality with larger sensors at lower prices than the E-M10, like the Fujifilm X-M1 or the Sony a5000, but neither has in-body stabilization or a great EVF, two amazingly useful features. For me, when weighing price, it really comes down to weather-sealing. If you photograph landscapes or find yourself in rough weather conditions often, it can mean the difference between simply being able to shoot... and, well, not being able to shoot. That's where Panasonic GX7 or a more expensive OM-D body makes more sense. But if you really don't care about rain or dust, the E-M10 is a trusty, splendid little companion in almost every way.